More than 40 million people worldwide suffer from concussions each year, but scientists are just beginning to understand the traumatic forces that cause the injury. 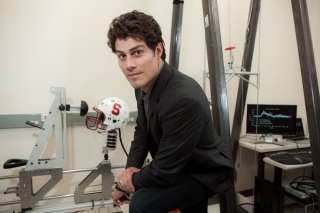 Now, a team of engineers and physicians at Stanford has provided the first-ever measurements of all the acceleration forces imparted on the brain during a diagnosed concussion. Their findings, which were published online Dec. 23 in the Annals of Biomedical Engineering, could lead to better injury detection, or toward developing safer protective gear. Previous research has measured the translational forces of concussion events based on three degrees of freedom —up/down, left/right, front/back — but scientists have long believed that rotational accelerations play a prominent role in the injury. Led by senior author David Camarillo, PhD, an assistant professor of bioengineering, the researchers outfitted Stanford football players, local boxers and mixed martial arts fighters with sensor-laden mouthguards that can measure rotational accelerations on the head — roll, pitch and yaw — as well as the translational forces. This gives researchers six degrees of freedom to measure. The mouthguard was originally developed by the Seattle-based company X2 Biosystems for consumer use, but Camarillo’s lab has customized the device, allowing the researchers to create the clearest-ever picture of the forces imparted on the head during an impact. Altogether, the mouthguards recorded more than 500 impacts sustained during regular sporting events. Two of these impacts resulted in diagnosed concussions, and are believed to be the first-ever concussion events to be recorded with six degrees of freedom. Statistical analysis of the impacts revealed that measurements made with six degrees of freedom were more predictive of injury than those made with just the standard three degrees of freedom — the translational forces — typically recorded in this line of research. They also found that rotational accelerations were a stronger predictor of injury than translational forces. The results put the researchers one step closer toward identifying a benchmark combination of accelerations that indicate a brain injury, but Camarillo said that the small sample size of the current study means much more research is needed to do so. If your eyes can’t communicate, your ability to perceive objects in three dimensions may be impaired, and you may feel out of balance, which is a classic concussion symptom. 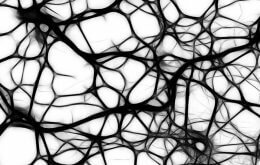 The current work, however, has helped identify a brain structure that bears closer scrutiny for its potential role in concussion symptoms. While the two concussion impacts inflicted very different magnitude and directional forces on the head, computer models indicated that they both put strain on a particular part of the brain, the corpus callosum. Previous concussion studies have identified the corpus callosum as a potential injury site. The industry standard for evaluating helmet effectiveness involves measuring only the three translational degrees of freedom. By continuing to suggest the strong connection between the rotational forces and incidence of injury, the Stanford group hopes it can influence industry to apply rotational tests to evaluate existing gear, or to even design helmets that minimize rotational effects. Real-time monitoring of head accelerations could also help limit the frequency and severity of injuries in sports. Sustaining a second injury shortly after the first can exacerbate the trauma and lengthen recovery time, but athletes often don’t realize — or don’t report — the initial injury. If future research can identify a minimum force required for injury, medical professionals could remotely monitor a player’s head impacts throughout a game and pull the player to the sidelines before he or she sustains greater injury. An ongoing complexity involved in this line of studying concussions, Camarillo said, is that many injuries go unreported by players. For instance, members of Camarillo’s research group had expected that by measuring head rotation, they would see a clear threshold between concussive and nonconcussive impacts, which has eluded previous studies. But even among the few concussions they measured, there were other impacts with higher rotational acceleration but with no clinically diagnosed concussion. Camarillo said that other factors could account for this discrepancy, such as variations in individuals’ tolerance to concussions or the player’s bite affecting the mouthguard’s measurements, but that he believes underreporting is the main culprit. Other Stanford co-authors of the study are doctoral students Lyndia Wu and Michael Yip; postdoctoral scholar Kaveh Laksari, PhD; Andrew Hoffman, MD, professor of medicine; Jaime Lopez, MD, professor of neurology and neurological sciences; and Gerald Grant, MD, professor of neurosurgery. The study was supported by the National Institutes of Health, the National Institute of Biomedical Imaging and Bioengineering, the David and Lucile Packard Foundation and the Child Health Research Institute of Stanford University. The study also was supported by Stanford’s Department of Bioengineering, which is jointly operated by the School of Medicine and the School of Engineering. Bjorn Carey is a science writer for the Stanford News Service.